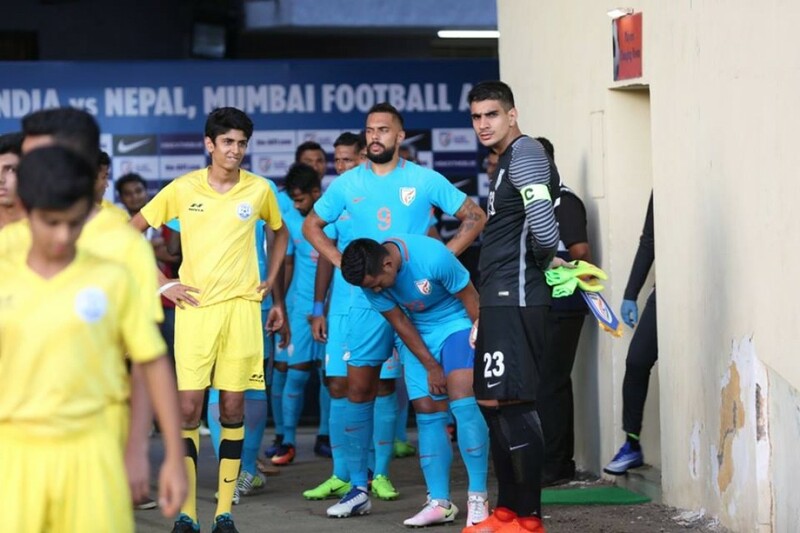 As a preparatory friendly for next week’s Asian Cup qualifier against Kyrgyzstan, India defeated Nepal 2-0 at Andheri Sports Complex in Mumbai. Sandesh Jhingan opened the scoring for the Blues while prolific striker Jeje Lalpekhlua added another to the goals count. 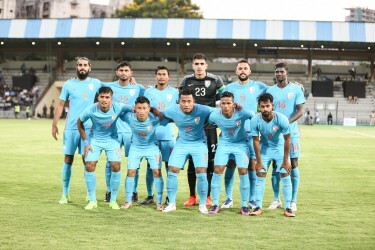 Despite a win, the match saw several missed chances by both the sides, notably by India’s Robin Singh who was later substituted at the beginning of the second half, making way for Daniel Lalhlimpuia. 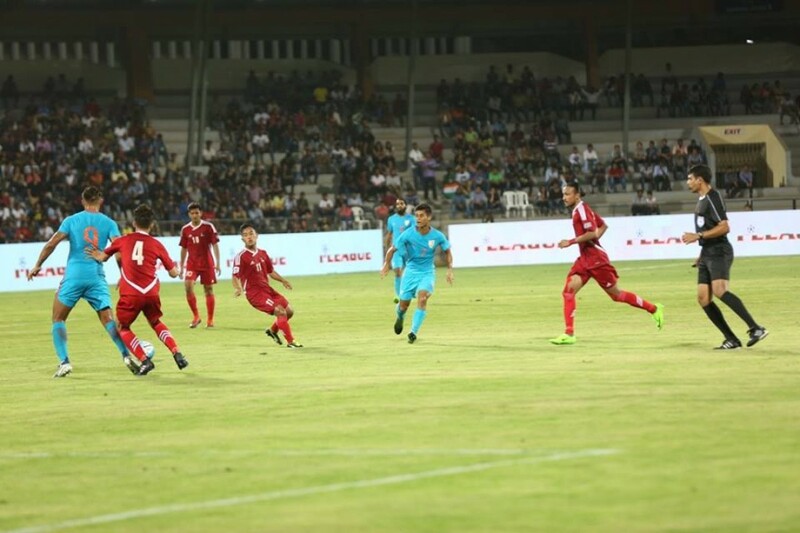 Nepal shot-stopper Kiran Kumar Limbu displayed a stellar performance but conceded two goals which meant the Gorkhas fell to yet another defeat against India. Let’s take a look at the players’ ratings of the friendly international game. The Indian international goalkeeper marked another excellent outing against fierce rivals Nepal. The 25-year old goalkeeper saved several shots by Anjan Bista, Bimal Magar and Rohit Chand. His best moment of the match came when Bista dribbled past Anas Edathodika in the 45th minute and tried to shoot in a one-on-one situation with only Sandhu between him and goal. Sandhu charged quickly and tackled successfully to unruffle Bista, who then, slated his shot wide under pressure. The Mohun Bagan right-back had a decent game against Nepal. The full-back sent several pinpoint diagonals, linked up with Jackichand Singh and, later, Bikash Jairu well and went on several overlapping runs into the opponent half. However, he was mugged off in his defensive duties in the match, especially in the first half as Rohit Chand went past him several times, creating a chain of attacks from the Indian right side. 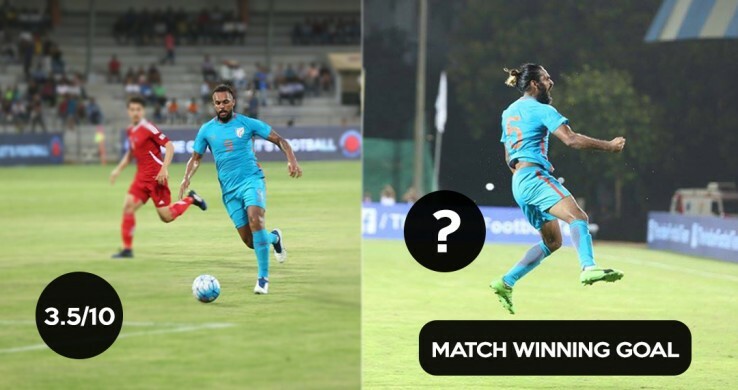 Jhingan stood as a wall at the heart of the Indian defence where he successfully nullified several Nepal attacks. He distributed the ball well over the pitch and also went on forward runs, creating chances. The Bengaluru FC defender scored the first goal of the match on the hour mark to provide a necessary lead to the home side over Nepal. Regarded as one of the finest centre-backs in the country, Edathodika displayed a brilliant performance against Nepal. 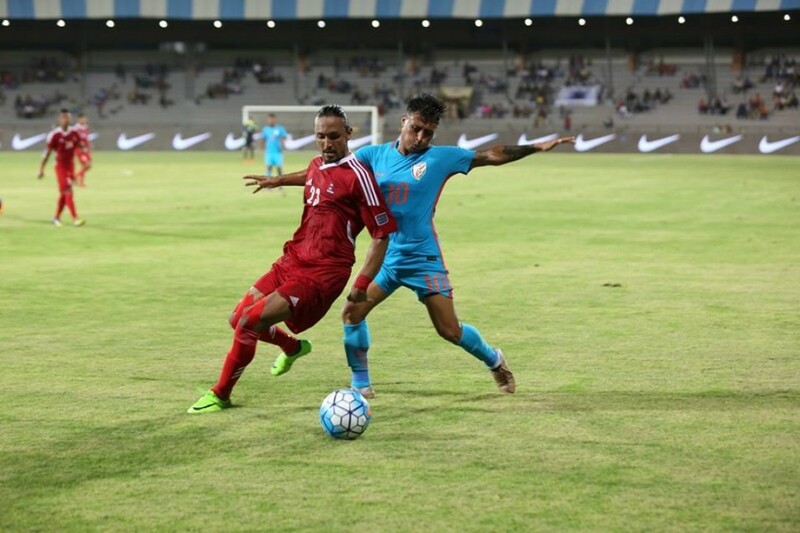 The Mohun Bagan centre back stayed back and covered for Sandesh Jhingan, who went up to join the attack several times in the match. Edathodika provided a necessary physical presence at the heart of the defence, nullified Magar on multiple occasions, distributed the ball well to the forwards with through balls. The 23-year old full-back had a decent game, considering the recently concluded season where he displayed several dismal performances. Das excelled in going on overlapping runs and linking up with Holicharan Narzary on the wings, he also did a brilliant job in the defensive duties as the Nepalis failed to break down the Indian left side and were forced to lose possession. The winger displayed a good performance against Nepal. Singh was instrumental in crossing the ball and creating chances for the striking pair in the first half. He linked up with his East Bengal teammate Robin Singh well but could not get into the assists chart as Robin failed to convert any of the chances into a goal. Borges started the match brightly but was forced to leave the pitch following an injury to his forehead. The holding midfielder excelled in shielding the back four as well as distributing the ball well during his short stay on the pitch. Nonetheless, he could not affect the game much due to his early substitution but did send in two through balls in the starting moments of the game. One of the finest performers on the pitch for India. Rafique displayed an extensive distribution, recycling and defending ability. His distribution of the ball resulted in the second goal of the game by Lalpekhlua. Though he missed his fair share of chances against the Gorkhalis, he made it up by creating chances and making key passes in the final third of the pitch. The 23-year old arguably was the best Indian player on the pitch in the first half but showed signs of fatigue in the second. Narzary played an integral role for the Indians, sending in pinpoint crosses and creating chances for the striking duo. The DSK Shivajians man showed a splendid performance on the left wing, shutting the Nepali full-back completely down. The player with the most dismal performance on the pitch, Robin didn't do much in his 45 minutes on the pitch. Though he was seen contributing to the midfield and tracking back to regain possession time and again, he failed miserably in his primary duty, to score. The striker missed three clear-cut chances and two 50-50s, which resulted in him being substituted off at the beginning of the second half. He missed converting several headers as well as sitters which denied India sealing an early victory over the Nepalis. 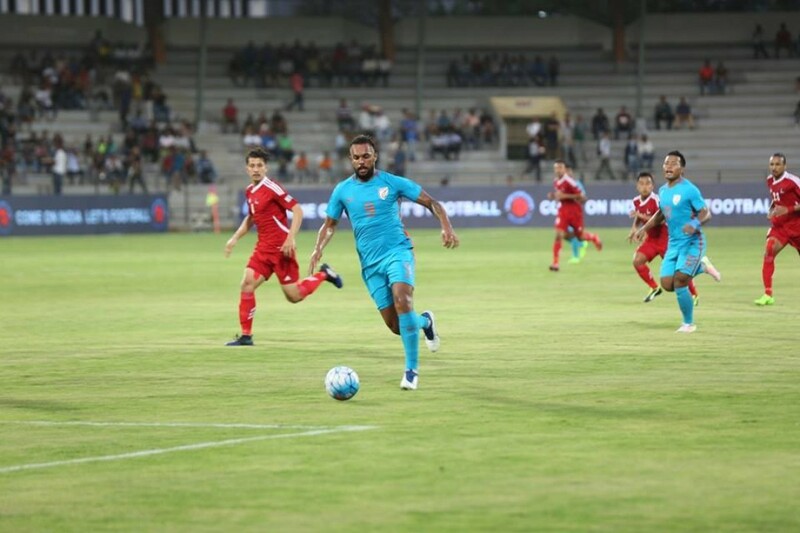 Started as the second fiddle to Robin Singh, Lalpekhlua was immediately promoted to the lone striker’s position as soon as Daniel replaced Robin at the beginning of the second half. Jeje displayed a necessary physical presence at the top as well as good passing in the opposition half. The Mizo striker assisted the first goal of the match while scoring the second and sealing an emphatic win for the Indians. The midfielder replaced Rowlin Borges in the team and put up a brilliant performance against Nepal which led to praise from the Indian head coach. He shielded the rearguard well, forcing the opponents to go wide. He also took part in the ball distribution, which saw him creating some good chances for the Indian forwards. Jairu replaced his East Bengal teammate Jackichand Singh in the second half and added the necessary width and pace to the team. Jairu displayed perfect positional sense as well as good forward runs and dribbling ability. He also came close to scoring in the second half but his shot was stopped by the opposition goalkeeper. Daniel came in to replace Robin Singh and took up Jeje’s duties as the second fiddle while the Mizo striker went up. However, his league reputation was short-lived as he was caught in uncomfortable positions by the Nepali defenders, forced to give up the possession on many occasions. Nonetheless, he created two chances and came close to scoring in the second half but failed due to his poor finishing. Came on for Narzaray in the second half but did not have any impact on the game. Came on for Narayan Das in the second half. Made some good overlapping runs but failed to have any impact in the match. Came on to replace Sandesh Jhingan in the late parts of the second half but failed to make an impact on the game. The Nepal shot-stopper displayed a good performance in the first half but conceded two goals in the second. Nonetheless, he saved 5-6 shots throughout the match which makes him one of the best Nepali performers in the game. The Nepal skipper will want to forget the game as quickly as possible. Mahajan was one of most poor defensive figures in the team against India and got himself a red card in the second half which further weakened his already injury-plagued team. Arguably the best defender in the Nepal team, Chaudhari denied the Indian forwards, especially Robin Singh on many occasions. He made important tackles throughout the match, won possession and cleared threats which made him one of the most dependable figures against India. A ball-playing defender, Shrestha made some good runs forward but fatigue made him sloppy in the second half which led to the second goal of the match. Much alike Mahajan, Tamang also had a poor day at the office. He was bettered by the Indian forwards which led to several chances for the hosts. However, his decent distribution skills helped the Nepal team to win back some territory. One of the best performers of the night, Bista would call himself unlucky for not being able to convert the best chance of the game. Bista shielded the back four well but lost possession at times. However, he was subject to creating the best chance for the Nepalis in the 45th minute when he dribbled past Edathodika and a tackling Sandhu but failed to put the ball into the goal. One of the decent dribblers in the Nepal team, Sujal created many chances for the forwards but was taken advantage of due to his comparatively shorter height. He also made Sandhu work on many occasions when he put some good attempts on the Indian goal. One of the few Nepali players plying their trade overseas, Chand definitely was a player to catch the spectators’ eyes while playing against India. The 25-year old displayed a good defensive performance in the game. His best moment of the game came when the defensive midfielder made a goal line clearance of Jeje’s header in the second half. Rohit was a pillar in the centre of the park and diffused various Indian attacks in the bud. Nepal’s prized asset. However, failed to attract all the eyes towards himself as Magar often let the Indian defenders get the better of him in the opposition half. Nonetheless, he made some good solo runs but failed to convert any of them into a goal. The Nepali forward made some decent runs to the opposition half but could not get into the box courtesy Sandesh Jhingan. He lost possession several times which allowed the Indians to go on quick counter-attacks. His only contribution to the game was creating one of the best chances in the first half with a cross from the left wing. Went up in one-on-one battles with Pritam Kotal but failed miserably. Came on for Magar in the second half. Failed to replicate the youngster’s performance against India. Lost possession against Edathodika and Eugenson Lyngdoh on multiple occasions. Replaced Sujal Shrestha in the second half but failed to make an impact on the game.